Kalahari Hunting News, Issue #8 -- Hunting at its best! The Leopard Hunt of a Lifetime! African Hunting Stories... Closing date soon! 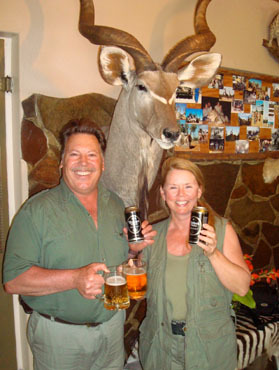 Picture top right: Enjoying Windhoek Beer at Uitspan Ranch - Duke and Terri McIntosh, with whom we had so much fun together! 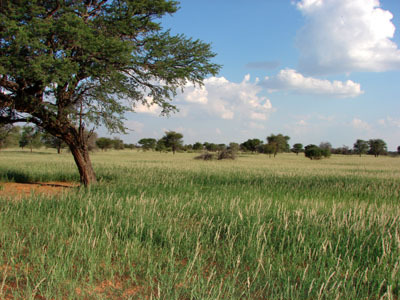 After a wonderful rain season, the Kalahari's red sand is covered with lots of grass and thus food for all the animal species. Since February, small animals like the Bat-Eared Foxes, Springhares, Rabbits and Steenboks tend to stay on the roads or open spaces around trees to escape from the long grass. They definately feel threatened in the dense brush and tall grass where they don't have a view of more than two or three feet in front of them. Their being in the open spaces makes them even more vulnerable since the predators can spot them easier. This picture was taken in March this year on Uitspan Ranch. Just see how beautiful and green it was. Although the grass grew a lot higher after this, is turned yellow after the first frost and the landscape once again changed its "outfit" - ready for the winter! The new free Kalahari Wallpaper for you this month, is a beautiful picture of a Gemsbok antelope in the Kalahari. A gecko with a bark! "You may not think I tell the truth, but there is a gecko that barks. He always "barks", not like a dog, oh no! 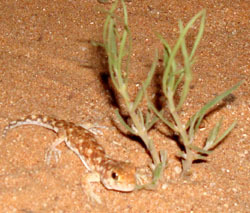 He has a burrow with a funnel-shaped entrance and when the sunset come to show its face, the male-gecko-bark is for the females. The sound can be heard a few hundred yards away, and that is why he is so clever." 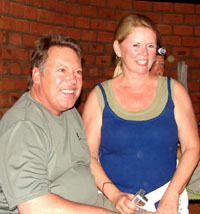 In April, Duke and Terri McIntosh from Michigan, USA, visited us on Uitspan Ranch. This was their first time in Africa. We had a lot of fun together and often wished that they could stay longer. There is a story behind their Africa Hunting Safari... Terri didn't want to come. She had a lot of fears for the "dark continent" - its bugs, its poverty, aids, killer animals, etc. She wrote down her experience before, during and after their hunt in Namibia, Africa. Below: Terri got so excited... she kissed the wrong man ;o))! Click here to go to Terri's story! Duke hunted a Duiker, Impala, Blesbok and Blue Wildebeest on Uitspan Ranch. 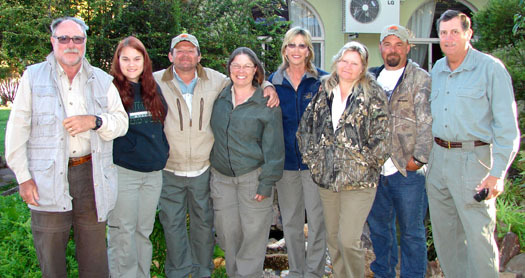 At the end of April, we had our special hunting friends from Cape Town, South Africa. 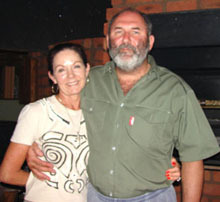 Hannes and Hester Swart come every year to Uitspan Ranch to fill up their freezers with Kudu-, Springbok-, Eland- and Gemsbok meat. Hannes do all the processing himself and find it a good way of relaxing from his job (he is an Industrial Psychologist). Hannes took this year 5 Kudus and 4 Springbok. On the last evening of their time in our camp, they invited us to dinner! It was quite a treat to be catered for, instead of US catering FOR our guests as usual. Thank you, Hannes and Hester, for your kindness and great company every year! Then there was... The "Gilden Group". Two charter planes... 8 Americans... 4 professional hunters... 3 assistants/drivers... 2 skinners... 2 cooks... 3 children of the family... 2 pilots... resulting in 18 trophies and 4 hectic days of organizing the logistics on Uitspan Ranch! On the picture from left to right: Bob Foster, Nyka Tucker (niece of Garth and Tami), Garth and Tami Gilden (from Fidalgo Taxidermy in Washington), Connie Payton (wife of Randy), Nora and Eric Jensen and Randy Payton. There was not nearly enough time to really get to know each of our guests better (as we like to do), but we hope they enjoyed their time with us. Here a few of their pictures. It was quite difficult to decide who's pictures of which trophies to publish in this issue! 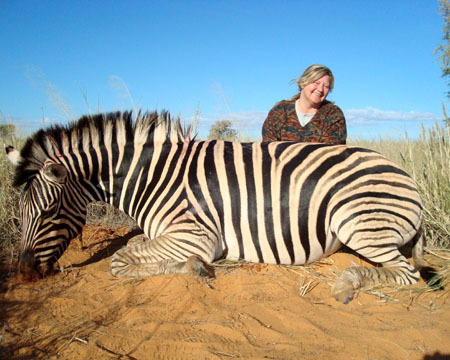 Below: Nora with her Burchell's Zebra... She also took an Impala. 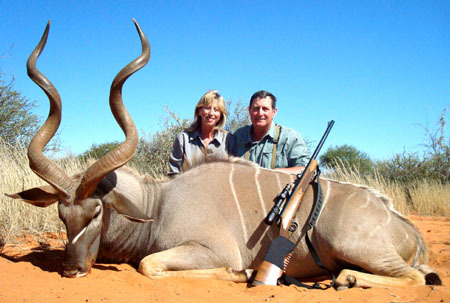 Below: Connie and Randy with his Kudu... He took 1 Gemsbok and 1 Kudu. Below: Garth with his Springbok... He took 1 Eland, 1 Steenbok, 1 Kudu, 1 Gemsbok, 1 Springbok and a few smal animals. 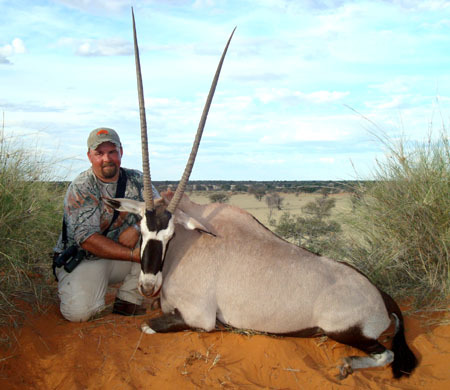 Below: Eric with his Gemsbok... He also took 1 Kudu, 1 Duiker and smaller animals. 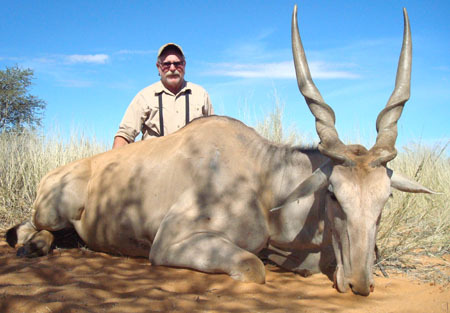 Below: Bob with his Eland... 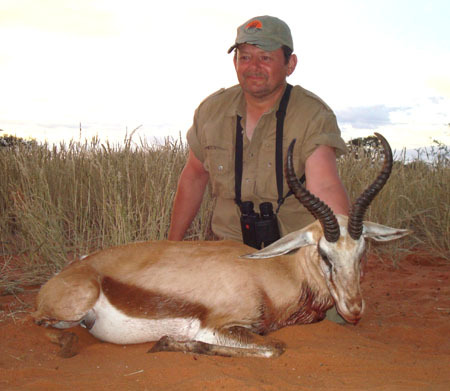 He took an Eland, 1 Gemsbok, 1 Impala and 1 Hartebeest. This hunt ended... after a night of waiting for THE Leopard. They didn't get it that night. But let's tell this Hunting Story from the beginning. Predators like Black-Backed Jackals, Caracal, Hyenas, Leopards and (once in a while) Lions, cause huge losses here in the Kalahari for ranchers living near the Botswana border. If any of these predators make a kil, we know that it will come again and again. We often have to track down such predators. These kind of hunts give you a total different scenario than sitting in a blind and waiting for a Leopard to come in. 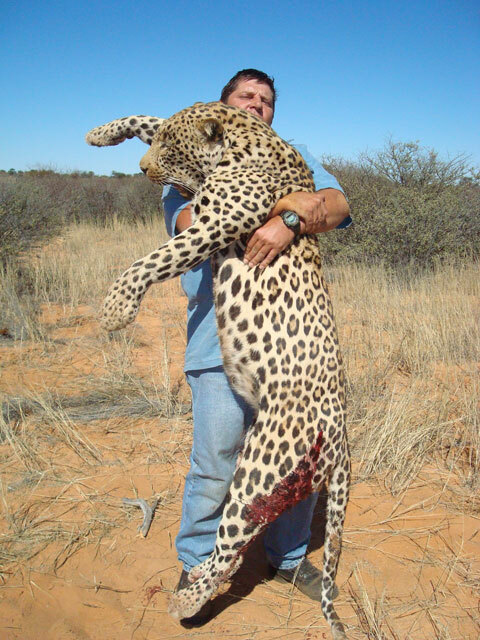 This cat made several kills over 5 days - the first day a really big Gemsbok (of ±228 lb). It ate huge parts of the antelope... even the brisket bone (see the picture below)! Normally they eat only the parts with soft meat. Below: Pics of some killings. 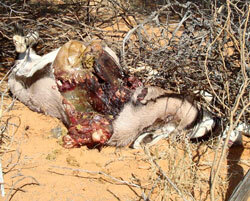 We immediately knew that it is only a big cat that can kill such a Gemsbok. Eric and Garth (of the Gilden-group) just finished their plains game hunt and both of them were excited at the opportunity to add a Leopard. Unfortunately it was their last day in Africa - they had a plane to catch home. The day after the Gemsbok kill, we waited late afternoon till ±10 o'clock for the cat to return to it's catch. Just after dawn, I got excited when I spotted something about 100 yards from us - coming in the direction of the killed Gemsbok. However, it turned out to be another Gemsbok. Shortly after this we heard her snorting- as they normally do when they sense danger. I heard also the sound of clashing horns and thought that it was two bulls fighting. The next morning we saw that it was indeed the Leopard that caught this female Gemsbok's calf while we were there - just a short distance away! However, it wouldn't have been able for us to see the cat in the long grass and darkness. After more kills in the following nights, we decided to take the dogs and track it down. 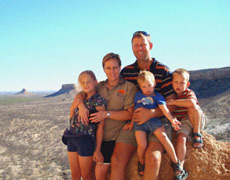 In the Kalahari we have the advantage that we can stay on the tracks more easily because of the thick, red sand. We tracked it on foot for 2.5 miles with two trackers and 4 dogs. The dogs picked up on him and immediately the one dog was badly bitten by the cat. We heard the commotion and knew then that we are very close - although we couldn't see far ahead because of the dense vegetation. The chase went on for a further 1000 yards in very thick brush which made it impossible to get a good, clear shot on the Cat. The only chance on a shot was on 120 yards when the cat was running behind a row of bushes and I saw that he will cross this one specific opening of ± 5 inches. The bullet broke his spine and exited on the opposite side's hind-quarter. This is the fattest and biggest cat I’ve ever hunted. It weighted ± 70 kg. I again learned some valuable lessons: In the future I will stick to my 30-06 with which I would have been able to shoot from a longer distance. If he would have turned on us (as I've seen several times before), the back-up gun would have been not within reach at that moment and I would have to use a gun which was not mine. Everybody involved in such a hunt, has to be in shape and fit enough to handle any physical challenge. In my opinion, THIS is the ultimate hunting experience in terms of dangerous game. I wish this for all true and great hunters! We also had Chris Widger visiting and hunting with us. We had a quiet, but most enjoyable time with him. We will publish his and other hunting news and pictures in the next issue of our Newsletter. 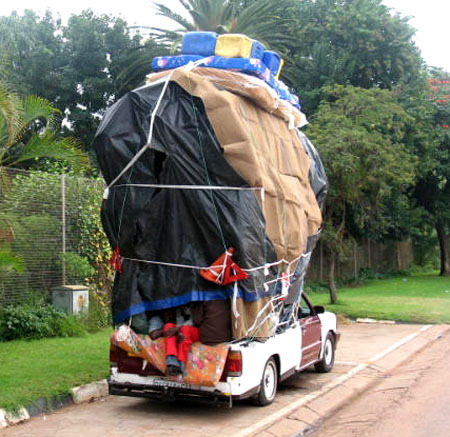 This one is definately already loaded! 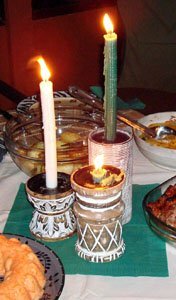 Terry Blauwkamp wrote another great article for our website. As someone who has been to Africa 20+ times, he definately has something to share about TRAVELING TO AFRICA - don't you think? 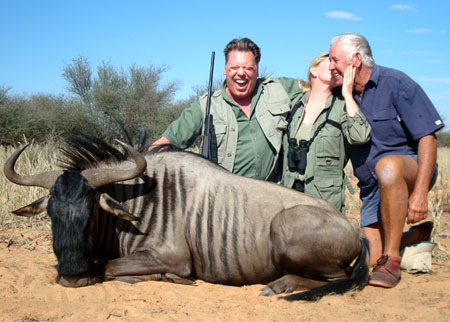 So this is a brand new but long planned page on www.kalahari-trophy-hunting. Since we launched the Hunting Story CONTEST on our website, we've received 19 African Hunting Stories! The closing date for entries, is June 30th 2008. So if any of our subscribers still want to add a story, better hurry up! We received exceptional stories! The judges will have a tough task to choose the best one. Below you will find links to the Hunting Stories which were submitted since our previous issue (alphabetically). We added a new Newsletter-comments page on our website. 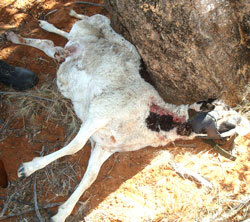 This is especially for those of you who would like to send a commenton Kalahari Hunting News. Who is there that can stop a violent earthquake? Who can put a cork on the mouth of a volcano and stop the flow of destructive and killing lava? Who can protect his house when a tornado is headed toward it? Who can ward off the attack of an overwhelming number of fully armed murderous thieves? The answer we will find in Psalm 46:1-3, where we read, "God is our refuge and our strength, a very present help in trouble. Therefore will we not fear, though the earth be removed, and though the mountains be carried into the midst of the sea; though the waters thereof roar and be troubled, though the mountains shake with the swelling thereof." The almighty God is our hope. He has all things completely under His control. Threatening political, social, and economic situations are not due to temporary loss of control. With God there are no accidents. Every creature large and small with life and without life, depends every split-second upon God for its existence, and does only what He is pleased to do through it. We have, therefore a powerful Father Who does not simply keep every creature from working against our good, but in working what is for the good He promised us. He is our refuge but also our strength. In Him we hide, and His strength will surely keep us safe and bring us to everlasting blessedness. We are headed for wars and rumors of wars, nation rising up against nation, famines, pestilences, and earthquakes in diverse places (Matthew 24:6-12). But we are not only safe; all these will serve the purpose of preparing the way for Christ's return, and will bring us to the city of God and its everlasting blessedness. ...When God creates faith in a man, it is certainly as great a work as if He were creating heaven and earth anew. how to load a vehicle!